Have you ever wondered why the faces on drivers, are not flat like an iron? 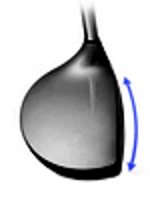 There is a certain amount of curvature to the face of a club which causes gear-effect. Because the head of a wood shaped object is more 3-dimensional in shape, curvature is incorporated onto the face of the club to help compensate for directional problems caused by shots hit other than where the center of gravity is located. Think of the head and ball as a pair of gears. As the ball (Gear #1) strikes the head (Gear #2) on the toe, Gear #2 turns to the right. 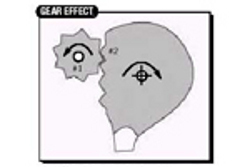 As Gear #2 turns right, Gear #1 turns left. This is what is called gear-effect. "Gear-effect" is the term used to describe the action of the club head, during impact with the ball that causes a shot to curve in a draw or in a fade or slicing motion. HORIZONTAL BULGE: The curvature of the face of a wood from heel to toe. 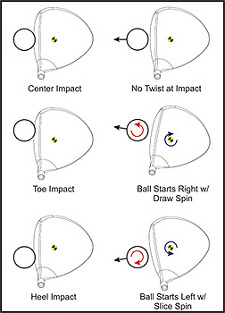 Bulge aids in imparting corrective spin to shots hit on the toe or heel of the wood face. Bulge, which is responsible for horizontal gear-effect, is measured in inches, and the majority of drivers are built with 10 inches of bulge. 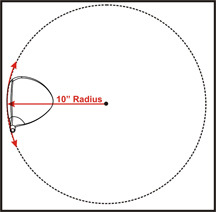 To provide an example, imagine a circle 10 inches in diameter. The arc of that circle is the measurement of the bulge. A 12 inch diameter would reduce the amount of curvature. The club head at impact will rotate around its vertical center of gravity (CG) axis, and not around the shaft’s axis. At impact, if the ball is aligned directly in-line with the club head’s CG, then no sideways twist will occur. However, golf is a game of misses. Hit the ball near the toe and you can feel the club twist open in your hands. Impact toward the heel of the club and you get an entirely different feel, because of gear-effect. When the head rotates in response to a toe-hit, the ball slides, then rolls, sideways across the face from the toe toward the center of the face. This causes the ball to leave the face with a hooking or draw sidespin. Conversely, when the head rotates the other direction in response a shot hit off the heel, the ball slides, then rolls, sideways across the face from the heel toward the center of the face, which causes the ball to leave the face with a slicing or fade sidespin. VERTICAL ROLL: The measure of face curvature from crown to sole on wood clubs. The gear effect not only works with horizontal plane (bulge), but it also works in the vertical plane as well. Vertical gear effect occurs when the ball makes contact higher or lower than the actual center of gravity. If the impact is made above the CoG, the face will rotate and increases the loft. Impact made below the CoG will de-loft the clubface. As the head rotates, the vertical roll will impart the opposite spin to the ball. An impact made high on the face above the CoG will create a higher launch angle, and the vertical gear effect will actually cause the ball to spin less. This can produce greater distance as the ball is subject to less lift or drag that a higher spin creates. An impact made below the CoG will cause the ball to fly at a lower launch angle. However, the positive effect of the vertical gear effect will increase the spin rate of the ball to help maximize trajectory and distance. Seldom will one strike the ball directly in line with the center of gravity in either the vertical or horizontal planes. Therefore you will experience both a certain amount of backspin and side spin, with the horizontal and vertical gear effect built into to-day’s 460 c.c. titanium driver heads helping you on your miss-hits. 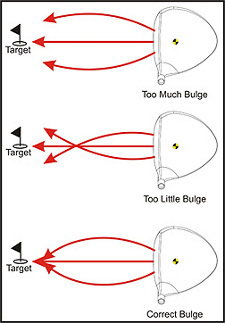 HORIZONTAL BULGE simply needs to exist within a reasonable range of radii on each driver head to perform its proper function for off-center hits. However, it is possible for there to be too much bulge radius on some poorly designed driver heads which would cause toe and heel shots to go too far off line, so that the natural fade or hook sidespin cannot bring your ball back. So make sure your manufacturer publishes the bulge on that driver head you have spent your hard earned money on, and be aware of what works for you. 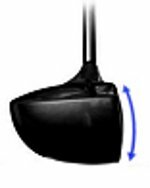 VERTICAL ROLL exists today only to change the loft on the face of driver heads to be higher on the top half of the face, and lower on the bottom half of the face. As driver head face height has increased so much with to-day’s larger head sizes, vertical roll can change the loft by as much as +/- 3 degrees over the vertical hitting surface of the face. Because loft is such an important relationship to distance, and because we mortal golfers will hit the ball in different positions vertical on the face, vertical roll can contribute to a large discrepancy in distances achieved.